The Thomas James Store is owned by the Mathews County Historical Society. 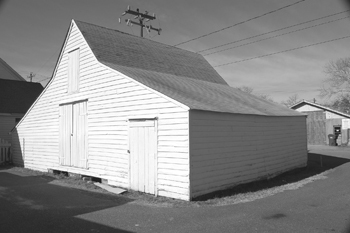 Built in 1820, it is one of the best preserved early stores in the South. One of Colonial Williamsburg’s senior architects noted, “We’d kill to have a building in this kind of condition in our Historic Area!” Moved back about one hundred feet around 1850 from its original location on Main Street in the Courthouse district in the county’s center, it was encapsulated in the building you see below within the next few decades. This accounts for its remarkable survival. The building itself is the primary collection, though plans include the display of small artifacts (including archaeological items) starting in the Fall of 2013. Explanatory labels discuss the many features of period building technology visible.